European Council of International Schools, U.K.
"Do not go where the path may lead , go instead where there is no path and leave a trail"
Having laid the foundation of Maheshwari Public School (MPS) in 1977 , Dr. Ashok Gupta worked incessantly to make it one of the best schools in the state. His long association with the MPS helped him acquire not only an insight into the working of educational institutions but also an expertise in running them professionally and profitably. He used this acumen and understanding to establish India International School in 1990, the first institution under the banner of ICFIA (Indian Council for International Amity). 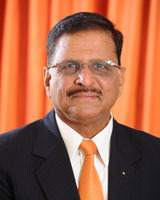 Thereafter, he established the International College for Girls and International School of Informatics & Management in 1995, The Play House in 2001, CRS FM Radio7 in 2005, ICG Institute of Educational Research & Development in 2006 and International Institute of Management, Engineering & Technology in 2008. The International College for Girls (ICG) has now been conferred with the status of a deemed to be a university, in the name and style of The IIS University, by the Ministry of Human Resource Development under section 3 of UGC Act, 1956. All the institutions aim at imparting quality education and can boast of an enviable infrastructure raised to ensure it. Dr. Ashok Gupta’s penchant for perfection has elevated them to temples of learning, where education is a commitment and the training of the whole person a mission. Welcome to a global crossroads for learning and exploration. A place where ideas and imagination take flight in spectacular surroundings, a place to pursue your passions and sharpen your mind, a place which will discover your strengths and a place to hone your skills to make an impact on the world. At ICG, a constituent unit of The IIS University, we teach girls to believe that nothing is beyond reach and that it should be our endeavour to be the best we can be and on all fronts. Academic excellence should exist alongside, and not in place of, a happy and enjoyable college life, which should be busy, productive and above all, meaningful. Remember your education is more than preparing for a career; it's really about preparing for a life. That's why, at ICG, we encourage you to pursue a variety of interests and passions, both inside and outside the classroom. It is an institution with a difference, an amalgamation of the tradition and modernity, a blend of Indian and Western, a heritage of vision and a legacy of innovation. An academic rigour, an exciting range of courses, excellent facilities and an enjoyable environment at ICG gives the college and unrivalled status. Girls entering our doors find themselves welcomed warmly and are taught to live together as a family, to be nurtured and cared for and to share and develop lasting relationships. Nationally recognized for its tradition of academic excellence, ICG – a constituent unit of The IIS University, is an institution committed to providing its students' academic programmes which will make a difference to their lives. We, as the stewards of learning, are dedicated to grooming and nurturing young girls into world ready women. Through diverse disciplines and focus on innovation and research, we are committed to cultivate critical thinking and creativity, inspiring lifelong passion for intellectual discovery. We teach students to develop the habits and mind-set to realize their full potential. We are very proud of our record and especially proud of the talent shown by our graduates. Thy leave this institution and go into the world informed, inspired and savvy enough to pursue their dreams and thereby enrich our culture. He is an eminent educationist who has made unforgettable contribution to restore the richness of educational culture and to make it more vibrant than before. His farsighted leadership, commitment to work, penchant for perfection, high concern for students and the breadth of vision has elevated the institutions to a centre of learning where education is a commitment and the training of the whole person a mission. "Service Above Self Award" by the Rotary International USA.